Today, to celebrate Easter I'm posting the Neapolitan Pastiera. 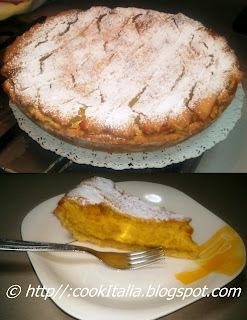 Pastiera is a type of Italian cake made with ricotta cheese. It originates from the area of Naples. It is a typical cake during Easter time and is one of the fixed point of Neapolitan cuisine. It had the recognition of traditional food product. The pastiera was probably invented in a Neapolitan convent. An unknown nun wanted that cake, symbol of the Resurrection, to have the perfume of the flowers of the orange trees which grew in the convent’s gardens. She mixed a handful of wheat to the white ricotta cheese, then she added some eggs, symbol of the new life, the candied citron and the aromatic Asian spices. The nuns of the ancient convent of San Gregorio Armeno were considered to be geniuses in the complex preparation of the Pastiera. They used to prepare a great quantity for the rich families during Easter time. Prepare the short pastry: Blend into a mixing bowl the flour and the sugar then make a weel in the flour and put in the center the eggs, a pinch of salt, the cold butter, the lemon peel, the cinnamon and Limoncello liqueur. Knead quickly with the aid of a fork until it appears homogeneous, make a ball (picture 4) and wrap it in a clingfilm and let it settle in the refrigerator for about half an hour. Prepare the wheat cream: Put the milk with the wheat in a pan and let it cook for about ten minutes (picture 1). Then add the butter, half-dose of sugar and the lemon peel (picture 2). Let it cook for another 20 minutes or until it becomes a thick cream, stirring occasionally (picture 3). Leave it to cool and blend it with an immersion blender. In another bowl, mix the ricotta cheese with the remaining sugar and vanilla (picture 6), then add the eggs, the salt, and the lemon flavouring (picture 7). Mix well then add the blended corn (picture 8). Roll out 3/4 of the short pastry on a sheet of baking paper, then place it into a 30 cm in diameter baking tray in order to cover up the edges (picture 5). Riddle the base with holes by using a fork and pour the whole wheat cream. Roll out the remaining short pastry and cut it into many strips to decorate the pastiera (picture 9). Cook the pastiera in a fan-assisted and preheat oven at 170°C (337° F) for about one hour. Let it cool, sprinkle with icing sugar and serve it.